Ellie and Olly's wedding was fab! They got married at the very beautiful Selby Abbey, then on to Ellie's mum's house where they had a secret garden theme with a marquee. I went along to the house beforehand to do bridal preparations. I love doing the preps! It is a lovely part of the day. I never get in the way, and just snap around what is going on, as well as getting beautiful detail shots of the dress, shoes and flowers. On to the abbey and Olly and the lads were still in the pub! Selby Abbey is beautiful and it was amazing to do a wedding in there. Got some great shots of Olly and the lads - I love to do these in a very informal way. Then Ellie arrived, looking gorgeous! The ceremony was beautiful and very emotional. After a few group shots outside the abbey, everyone made their way back to the house. So much thought and time had been put in to the garden and marquee - it looked amazing. Guests walked through the back gate, through a flowered archway, which opened up in to the beautiful garden full of flowers and other details. We got some fab shots! Ellie and Olly are a really fun couple and we ended up on the local tennis courts, getting photos of bride and groom playing tennis with the bridal party! All in all another wonderful wedding - full of emotion and love. It was a pleasure to be a part of such a special day. I hope I get more weddings at Selby Abbey. 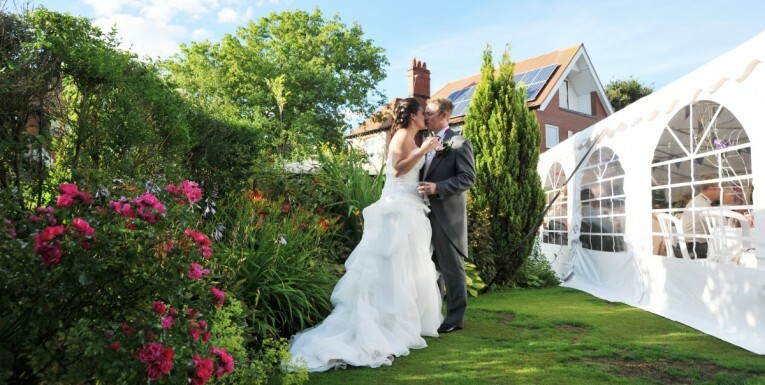 Wedding photography in Selby is as lovely as wedding photography in York!